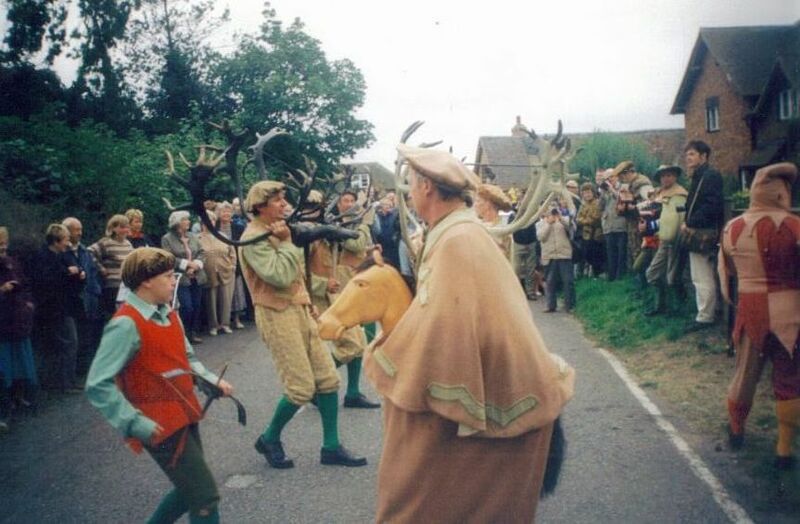 The Merry Month of May..is a great month of those fascinated with calendar customs and ceremonies, there are hundreds alone on May 1st or one some occasions to the May Bank Holiday, restricting oneself to three is difficult..so I’ve picked a favourite surviving one.. So was my question and reply from Minehead’s tourist information! Now what I am inferr from this enquiry? Are Tourist Information places useful for information on customs? Perhaps not always. Is that the organisers did not want it overly advertised? Perhaps yes and in a way that is not always a bad thing….for I get the impression that this tradition, in an area over-run by the holidayer and tourist, is perhaps culturally the only remaining local thing and that this custom is done for the locals and not for us tourists…and I have no problem with that…such customs are more likely to be driven by the locals need and desire to do it. Why wonders how many of these revived customs, forced back to life perhaps by parish’s and councils with one eye on the tourist potential, will survive. Anyhow I digress! 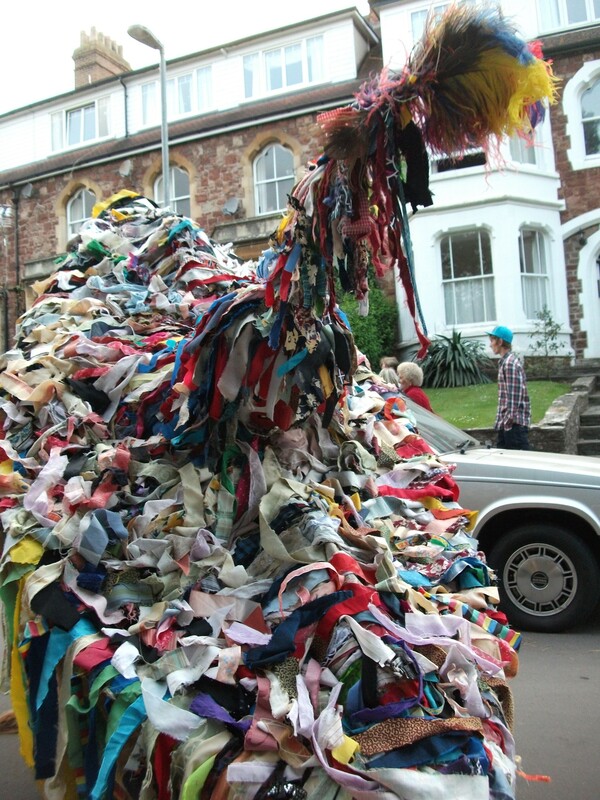 Last year May day bank holiday fell on a convenient date for those customs who have rightly stubbornly stuck to the first of May for their observations…the Minehead Hobby Horse is one of these. I had booked a nice guest house on the route of the Hobby Horse via the internet and arriving at its location found….I wasn’t booked in! It was their fault fair enough, but wasn’t going to get me somewhere to stay….the owner rung around and finally found a room. I think I know where it is…she said and we jumped into the car and followed her…Well I thought it was here….I’ll ask a taxi driver. So she did and the Taxi driver said….yeah follow me. And so we both followed him…..back to where he had started and which he jumped out of the car and said….it’s around him somewhere! Of course all along my satnav was saying something else..but you don’t like to disagree with locals do you? Finally following the satnav we arrived at our destination, a delightful Edwardian house high above the town and only minutes from where the Hobby Horse was to be awoken. The night before the 1st May is called Warning night and sitting by the harbour at the Old Ship Aground when the sound of accordionists bursts out of the club and the hobby horse is awoken to tour the town, swirling and jumping with the joys of spring, scaring children and comforting cars with a strange children like head nod. I had decided to see the awakening of the traditional sailor’s horse which happened at 5 am. It traditionally comes out on the eve of May Day and proceeds from the Quay over the hill through Higher town to arrive at White Cross early on May 1st. Looking out it was beginning to rain. Through the drizzle I could hear the eerie sound of the drums as they echoed from the harbour below and the addict sound of the accordionist which occasionally broke from its tradition ditty to the strains of Yankee doodle dandy!. They rain was not stopping this ancient observation which made its way through the lanes and streets of the old town ensuring that no-one slept that morning. This was a tradition in its truest sense, the hobby horse joined only by a handful of attendants and curious bystanders. 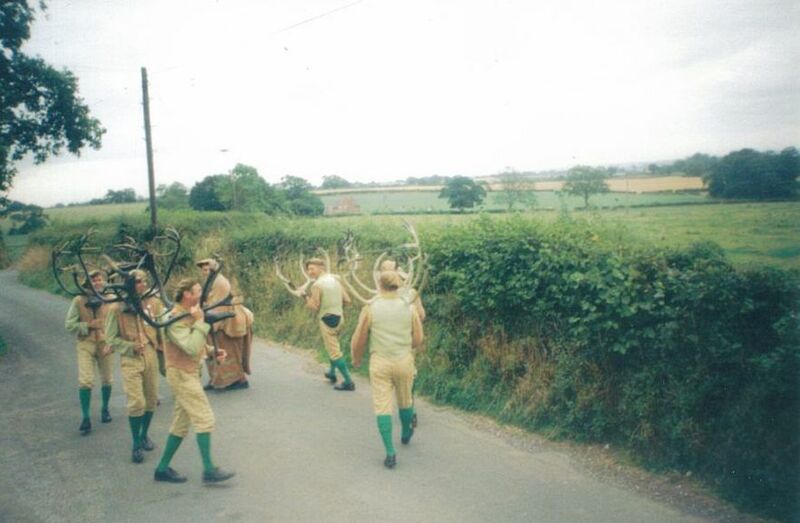 At certain times the Hobby Horse changed owners with the young men seeming desperate to be part of the action. It made its way to the white cross where it undertook a whirling and spinning dance and was joined by another horse…after a break it continued its journey back into the town. By then the town was coming alive and people were making their way around. Some particularly young women were barracked by the beast to much hilarity. No Bootie Night for me! 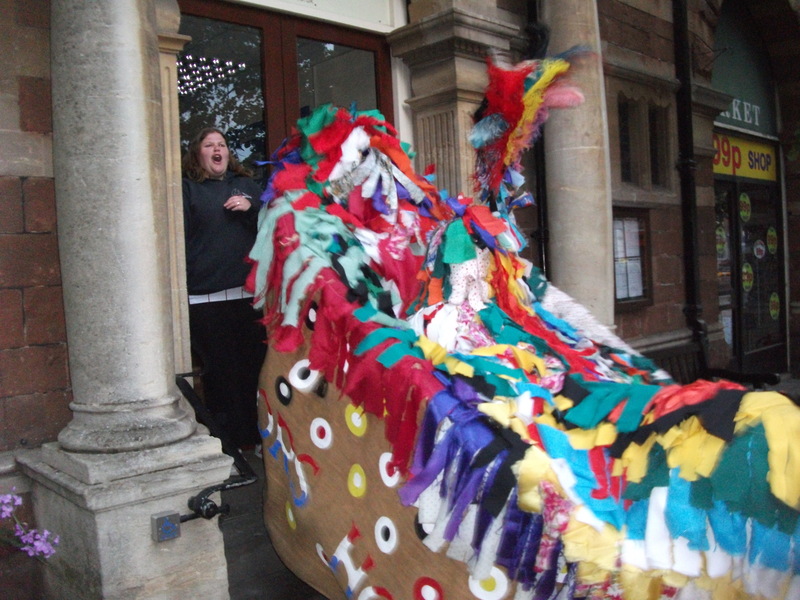 Origins of the hobby horse. 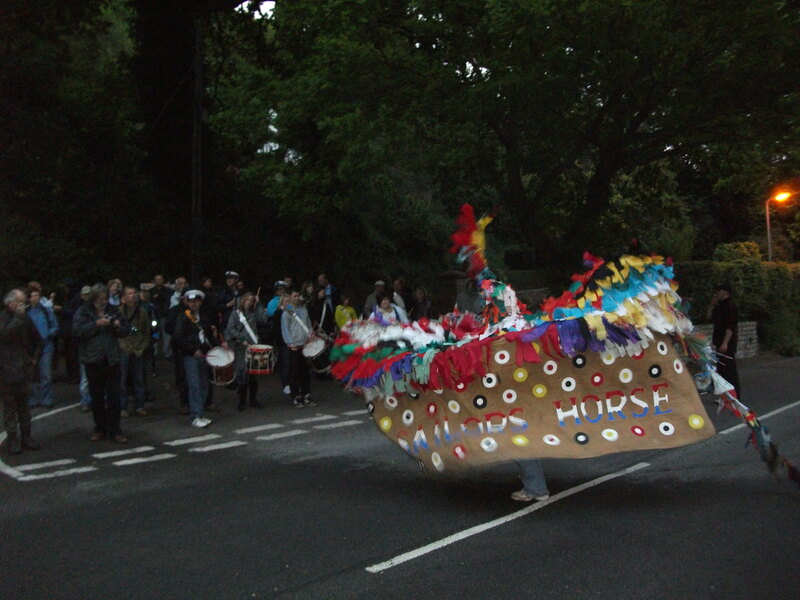 Certainly the Hobby Horse is boat like only having a length of rope for its cow tail and is covered with brightly coloured ribbons with a hole cut in for the body with a disc shaped face. 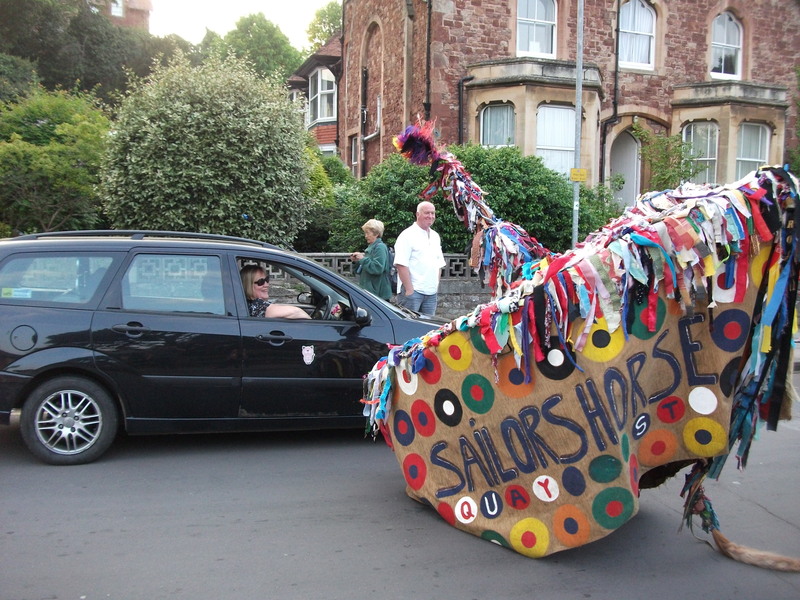 Whatever the origin Minehead’s Hobby Horse will continue to be one of the best May day customs in Britain, full of music, mischief and always mystery.